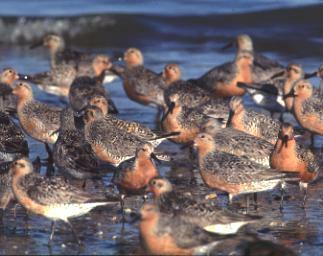 In 1999, the red knot was listed as a threatened species in New Jersey under the New Jersey Threatened Species Act. 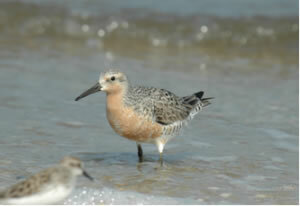 As a result of the Red Knot Status Assessment in Fall 2006, the U.S. Fish and Wildlife Service announced the red knot as a candidate for federal listing and the Committee on the Status of Endangered Wildlife in Canada recommended listing the red knot as endangered in April 2007. The DEP is taking a multifaceted approach to protecting this species and its habitat through shore protection initiatives and restoration of beaches to increase available spawning habitat. The red knot's decline is a warning that something larger is happening to the Bay's ecosystem. Steps must be taken to protect this unique ecosystem and its wildlife or it may disappear forever. The red knot is a migratory shorebird about the size of a mourning dove. A bright salmon face and breast against a spangled black-and-white back give this shorebird an overall pinkish look from a distance. Each spring, red knots migrate from wintering areas as far south as Tierra del Fuego, at the southern tip of South America, to breeding grounds in the Canadian Arctic – a 20,000 mile round trip. The red knot is one of our longest-distance migrants spending over 6½ months of the year migrating back and forth between wintering and breeding areas. The Delaware Bay is the linchpin of the red knot’s spring migration because it is the center of the Western Hemisphere’s only population of horseshoe crabs. Horseshoe crab eggs, unlike any other food resource, are quickly metabolized into fat that allows red knots and other shorebirds to double their body weight in a brief period – about two to three weeks. 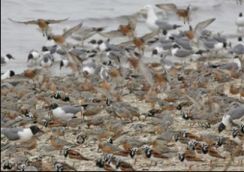 This weight gain is critical for survival because Delaware Bay is the last stop before red knots reach still-frozen arctic breeding grounds, where it takes one to three weeks for insect food to become available. The fat reserves, put on in Delaware Bay, allow red knots to survive and continue courtship, mating and egg laying until food becomes available. Without a sufficient fat reserve, the consequence is loss of reproduction, or worse, mortality. Although commercial horseshoe crab landings were poorly documented prior to the late 1990s, it is recognized that with the significant expansion of the conch pot fishery in the mid-Atlantic region, the demands for horseshoe crabs as bait further stressed the resource when added to the already existing bait demands for horseshoe crabs, particularly females, for the American eel fisheries. New Jersey was one of the first Atlantic coastal states to implement a state-specific horseshoe crab-permitting and harvest-reporting system in 1993. New Jersey horseshoe crab reported landings increased tremendously from 1993-1997, when it became necessary to implement limited entry , a ban on mobile gear in harvesting horseshoe crabs, and additional area and seasonal closures to reverse the increasing exploitation of the horseshoe crab resource. The implementation of an Atlantic coast-wide fishery management plan by the Atlantic States Marine Fisheries Commission in 1999 was effective in documenting and reducing the horseshoe crab commercial harvest for all states from Maine through Florida over the last decade. While there is evidence of increasing numbers of juvenile horseshoe crabs within recent years, the harvesting pressure on the spawning stock had not only impacted the sexually mature segment of the horseshoe crab population but reduced the abundance of horseshoe crab eggs available to feed the migratory shorebirds utilizing Delaware Bay beaches during the spring. As the number of horshoe crabs necessary to supply sufficient eggs to meet the needs of migratory shorebirds declined, so did the red knot population. While the red knot is most imperiled, most studied shorebord on the Delaware Bay, there are five other species that rely on crab eggs and whose populations have declined on Delaware Bay by about 65 percent: Ruddy turnstone (Arenaria interpres), sanderling (Calidris alba), semipalmated sandpiper (Calidris pusilla), dunlin (Calidris alpina) and the short-billed dowitcher (Limnodromus griseus). In 1999, the red knot was listed as a threatened species in New Jersey under the "New Jersey Endangered Species Conservation Act." 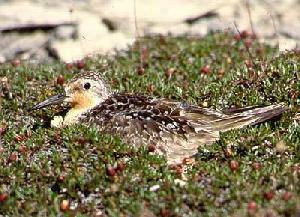 As a result of the Red Knot Status Assessment in Fall 2006, the U.S. Fish and Wildlife Service announced the red knot as a candidate for federal listing. In April 2007, the Committee on the Status of Endangered Wildlife in Canada recommended listing the red knot as endangered. In 2005, New Jersey and Delaware took significant steps to protect the red knot population from further decline. Both states imposed restrictions on horseshoe crab harvest during the spawning season and on public access to Delaware Bay and Atlantic Coast beaches to allow shorebirds to feed undisturbed. New Jersey then took additional steps to protect the red knot by restoring area beaches to their natural state, which provides good crab spawning habitat and removes debris that traps spawning crabs, and imposing a two-year moratorium (2006-2007) on horseshoe crab harvest to give the crab population a chance to begin recovery. Unfortunately, crab harvest continues in Delaware, Maryland, New York, and Virginia – with over 600,000 crabs being taken annually. The State of Delaware attempted to institute a moratorium in 2007 and 2008, but this effort failed and harvest in Delaware continues. The New Jersey Department of Environmental Protection continues to lead protection and recovery efforts on Delaware Bay. As the NJ moratorium on crab harvest expired in December 2007, DEP proposed a new rule, published in the NJ Register on December 3, 2007, to continue closure of the harvest until horseshoe crab and shorebird populations show signs of recovery. Biologists with New Jersey and Delaware Divisions of Fish and Wildlife, together with biologists from US Geological Survey (USGS), will publish a new framework to restore populations of shorebirds by creating peer-reviewed targets for horseshoe crab egg densities, red knot numbers and other key parameters. The states and their partners will attempt to adopt these targets and turn them into a new recovery scheme that will restore shorebird and crab populations and the Delaware Bay migratory stop over. Every year since 1999, DEP biologists have lead a team of shorebird researchers from the United States, Canada, Argentina and Chile to study red knot populations along the Atlantic Flyway and on breeding and wintering grounds. This year - 2007 - marks the 11th year of shorebord protection and monitoring on the Delaware Bay migratory stopover, and the 7th year of work on red knots in the Arctic (breeding) and South America (wintering). The NJ Natural Lands Trust, Division of Fish and Wildlife's Endangered and Nongame Species Program, Wildlife Conservation Society, National Fish and Wildlife Foundation and the Conserve Wildlife Foundation of New Jersey support this important work. There is a dramatic difference in weight from when a red knot arrives on the Delaware Bayshore and when it's ready to depart for the Arctic. Must gain a minimum of 6 grams of weight per day while in Delaware Bay, to complete its journey to the Arctic and successfully breed. 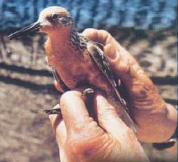 Red knots gained about 8 grams per day in 1997; now they only gain about 2 grams per day. Red knots are about the size of a dove with a distinctive breast of rusty red during the summer breeding season; has a short, straight black bill and long wings. In winter, red knots molt into a pale gray plumage and white breast. Usually seen in Delaware Bay on sandy beaches with gentle slopes and minimal wave action; often roost on long sandy spits at ocean inlets, marsh islands, or the high portions of sandy beaches. Foraging and roosting is important for the survival of red knots; frequent disturbance from beach recreation activities and off-road vehicles can reduce survival. 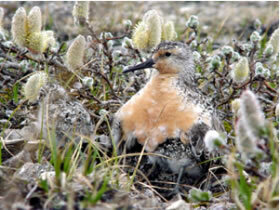 In the Arctic, red knots establish nests in vast areas of sparsely vegetated, low elevation tundra. In wintering areas they are found primarily on large tidal flats. The red knot is recognized as "highly imperiled" in the National Shorebird Conservation Plan, is candidate for federal listing in the US and Canada and a listed as a threatened species in the State of New Jersey. Don't walk on the beach during spring when shorebirds are present, and keep dogs on a leash. Use designated viewing areas for watching shorebirds, and study them from a distance with binoculars or a spotting scope. To learn more about suggested shorebird viewing areas, review the map in the following brochure: Imperiled Shorebirds on the Delaware Bay - What You Can Do to Help (pdf, 423kb). Order a Conserve Wildlife special interest license plate for your vehicle. It's tax-deductible, with 80 percent of the payment benefiting New Jersey's Endangered and Nongame Species Program. Volunteer! 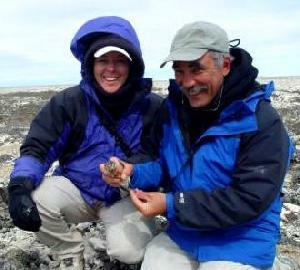 The Division of Fish and Wildlife is looking for motivated volunteers to become Shorebird Stewards. Shorebird Stewards assist wildlife biologists and conservation officer to enforce beach closures to protect migratory shorebirds and educate the public about impacts of human/dog disturbance. For more information about becoming a Shorebird Steward, contact Larissa Smith (609-628-2103). For information about volunteering for endangered and nongame wildlife projects, please visit the Division's Wildlife Conservation Corps Visit these sites for details. Learn new information about New Jersey wildlife. The Division of Fish and Wildlife offers eight E-mail "mailing list" choices to the public. Visit the E-mail List Subscription Page to learn more about this free service and how to sign up. Horseshoe Crabs and Shorebirds Fact Sheet (pdf, 441kb) - Partnership for the Delaware Estuary, Inc. Learn more about red knots and the team of NJ and international biologists studying them by visiting the links below.